Someday My Favorite: We Tell Stories. Being a parent is hard. I know I totally underestimated the weight of being a parent. I think being the oldest kid is hard, too. As a mom, I have a tendency to cast off a bit of that aforementioned weight on to my oldest. She is the oldest. She should behave. She should be helpful. She should be more responsible for her actions. But you know what? She is four. She is a four year old with an old soul and equally huge heart. 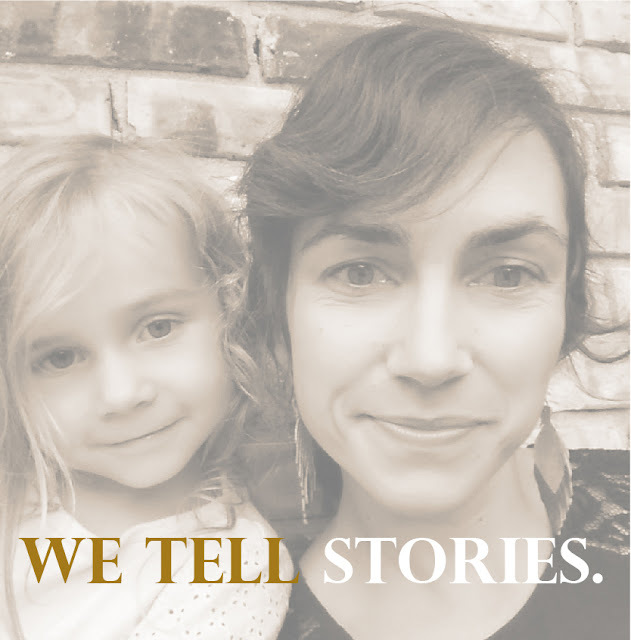 She is a storyteller and would rather spend intentional time with people than play with a baby doll any day. I love this about her and yet, I find it so hard. Hard to balance her need of intentional time with well, the rest of life. October is the #write31days challenge month. Last year, I loved, loved participating. When I thought about a topic for this year, I threw around many ideas. And I landed on this feeling. This desire for intentionality. The balance. Her storytelling. So, for the next thirty-one days we are going to tell stories. We may write them, we may act them, we may just hammer them out on the 'ole keyboard. But we are going to tell stories. Maybe I will gather them up into a book or maybe not. But for the next thirty-one days, we are going to tell stories. Here's the thing though, it is more about that storyteller. And a momma's attempt to lessen that same weight on the both of us. Join us each day in October. And stay for the stories. The #write31days challenge starts tomorrow. Join and join us! Good idea! Stories give life and help us remember! !